The Speedball Block Printing Baren is ideal for hand printing and proofing of block prints. This premium hand baren measures 4 inches in diameter and is made of heavy-duty plastic that is padded with foam and polyethylene. This creates an ultra-smooth slide. Using a printmaking baren is much more efficient than using your hands. It evenly distributes pressure creating a better ink image. The baren for block printing has a smooth, wooden handle. The handle is super comfortable and the perfect size for everyone. The baren is very easy to clean when you’re done with your project. The Speedball Block Printing Baren is proudly made in the USA! 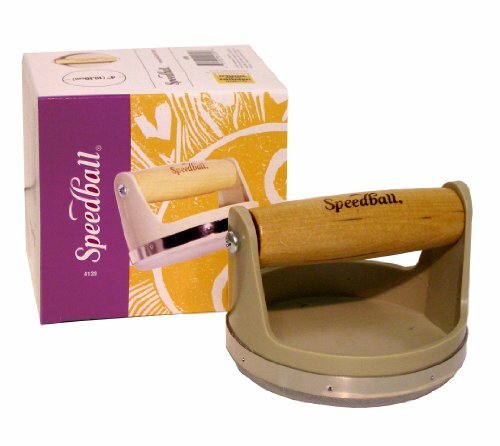 BLOCK PRINTING TOOL - The Speedball Baren is designed to help you create gorgeous prints. This block printing tool measures 4 inches in diameter. SMOOTH SLIDE DESIGN - The face of the baren is covered in nitex nylon which creates an ultra smooth glide across your paper. CREATES BETTER IMAGE - Using a printmaking baren is much more efficient than using your hands. It evenly distributes pressure creating a better ink image. COMFORT GRIP HANDLE -The baren for block printing has a smooth, wooden handle. The handle is super comfortable and the perfect size for everyone. MADE IN THE USA - The Speedball Block Printing Baren is proudly made in the USA!